This is just a quick post to mention a recent purchase we've made that we've been really satisfied with. 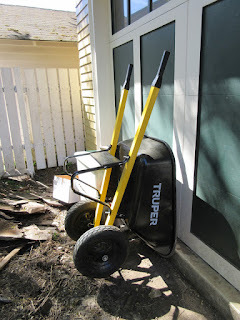 A friend of ours put us onto the steel Truper 2-wheeled wheelbarrow. We bought one of these wheelbarrows this spring and it's been a great tool for our backyard projects this year. During the course of our backyard cleanup, we've been able to fill it to the brim with gravel, bricks, or other materials and it holds up to the abuse. Because it has 2 wheels, it is stable; you can move it with one hand, if necessary. Anyway, for folks who live in Portland, we bought this assembled at Do It Best on Division for $100. It's been the best $100 we've spent for our backyard projects this year. For those not in Portland, I did find one for sale online here. I'm not being compensated nor was I asked to give this endorsement. We're just happy customers. I dumped over a wheelbarrow just today. Looks like it holds a lot, too. It really does. We can fill it to the brim and it still works well. Honestly, I only mention it because we've been so happy with this purchase. I dumped another wheelbarrow load today. Thank heavens it was just two bags of dirt. I'm eeking along with my old wheelbarrow, not very enthused with the idea of getting a new one. Thought this one was done for with a flat tire, but a new inner tube did the trick. New handles were last year's purchase. The plastic 'barrow' part is cracked, which I think provides excellent drainage. Gonna have to get a new one when it's time to mix some concrete for stuff later this year. I will take a look at this one. Thanks for the recommendation. If you're happy with plastic wheelbarrows, I think Home Depot carries 2-wheeled wheelbarrows now (at least they do at their website). I liked that this one came in steel. It's been great for hauling all that gravel. The good thing about wheelbarrow with one wheel is you can get them through narrow places. We still have the one-wheeled wheelbarrow, we just don't use it much because we're enjoying the new one so much. I dumped over yet another one. Roger said "I get it, you want a new wheel barrow. You don't need to keep dumping this one over, just buy the two wheeler." Roger loves old wheelbarrows. I swear he has about 3 or 4 of them and spare parts, too.